A leak have emerged recently regarding several internally circulated presentation slides from AMD about its CPU roadmap for 2018 up to 2020. This leak was first spotted by folks at Informatica Cero, and it contains several new and interesting architectural codenames. These include Castle Peak, NG HEDT, Matisse, Picasso, and Renoir. To be more specific, “Castle Peak” is apparently a codename for AMD’s next generation Ryzen Threadripper processors. The leak suggest that the company will be debuting Castle Peak processors sometime in 2019. The following year, Ryzen Threadripper processors will come with the “NG HEDT” codename, and it may be based on the Zen3 architecture. 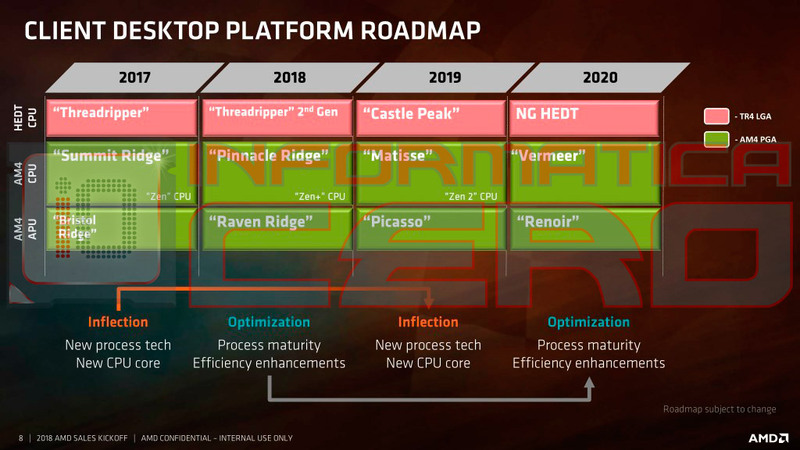 Meanwhile, most of our dear readers may have already known of the fact that AMD’s upcoming lineup of Ryzen 2000 processors are codenamed “Pinnacle Ridge.” Processors that will succeed Pinnacle Ridge, on the other hand, are known (for now) as “Matisse” and they will be making their debut sometime in 2019. These CPUs will feature the Zen2 CPU architecture. In 2020, AMD is expected to release Ryzen CPUs which come with the “Vermeer” codename. They will be based on the Zen3 architecture. When it comes to APUs, those that will be based on AMD’s Zen2 and Zen3 architecture will carry the codenames of “Picasso” and “Renoir” respectively. 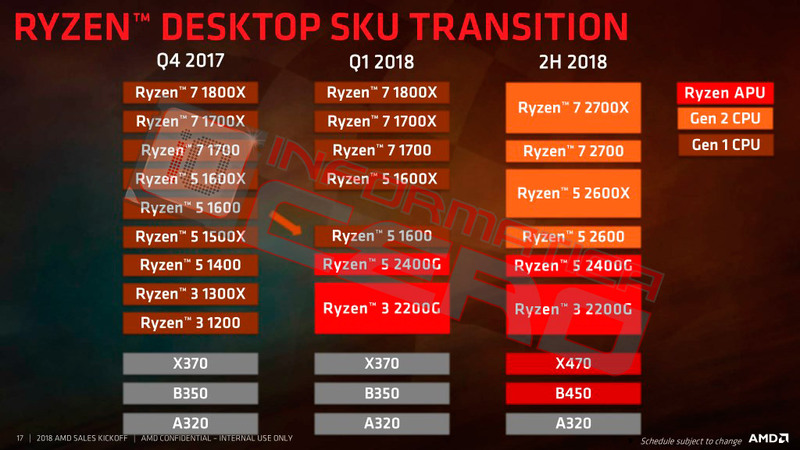 Those aside, this recent leak also mentioned that AMD will most likely only launch four SKUs in April during the official Ryzen 2000 launch. That said, consumers can expect the company to reveal more Ryzen 2000 SKUs in the future.